At the turn of the millennium changes in farming practice led to the birth of Windmill Lodges – holiday lets in authentic log cabins which were built on the former strawberry fields. We have been involved in the business since 2003, purchasing it from my parents in 2011 to enable them to enjoy their retirement in the French Pyrenees. We pride ourselves in being a small family owned and run business who employ local dedicated staff. Our guests comfort and wellbeing is paramount and it has been a great pleasure to get to know so many over the years. It’s a delight to see our guests celebrating birthdays, engagements and anniversaries as well as watching children growing up over the years they have been visiting. As a small family business we offer a very personal service, we do not use an agency and when you make an enquiry whether by phone, email or social media it will be either myself or Angela who responds. We have extensive knowledge of the local area as well as our cabins! Please do not hesitate to contact us about your personal requirements. 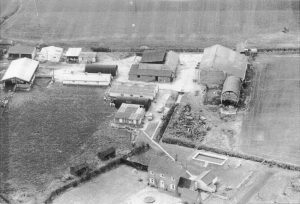 The log cabins are built on the field at the top of the photograph. John and Muriel Coe, my grandparents, who moved here in 1954. 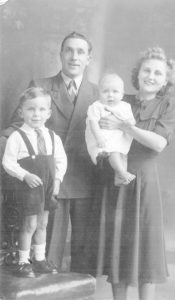 John and Muriel had three sons, Roger, Trevor and Christopher. Roger and Trevor are photographed here. 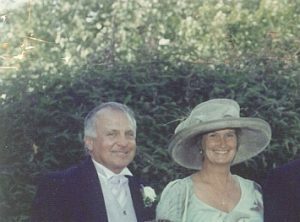 My parents, Roger and Bobbie Coe. My father Roger ran the farm and built the log cabins. They are now retired living in the French Pyrenees. 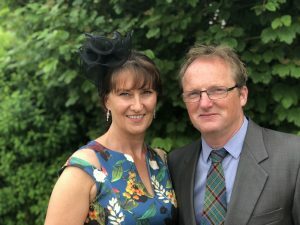 Myself, Lisa, and my husband John, having been brought up on the farm it is a pleasure for us to be continuing a family business on the same site. 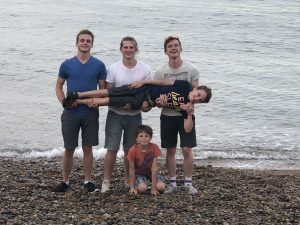 Our five sons, Oliver, James, William, Robert, and Joseph at one of our favourite spots – Aldeburgh beach. As a small team all the family help out – we’ve even had the youngest clearing snow!